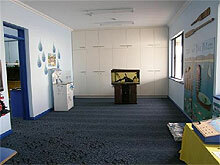 The Marine Discovery Centre (MDC) is a school based, environmental, hands-on learning centre. It has gone from strength to strength to become widely acclaimed as Adelaide’s leading Marine Education Centre and Adelaide’s most popular school excursion and community visit site. Our aim is to encourage an appreciation and understanding life-long learning of marine life with a view to promoting long-term conservation and sustainable use. The Centre is booked for visits almost 2 years in advance and has won 37 International, National, State and local Awards. We initiated the formation of the National Marine Discovery Centre Network which involves 9 Centres across Australia from New South Wales, Victoria, Tasmania, Western Australia and ourselves from South Australia. The network has had an annual workshop for the past 3 years enabling resource sharing, curriculum development and strategic planning critical for each centre. Tim Hoile, Director of our Centre, is the elected Chair of this outstanding network of marine educators. This network oversees 576,313 visitors annually. Our very enthusiastic and committed 42 volunteers are very professional and have a very high-level of expertise. Evaluations from visiting educators and adults consistently pay tribute to our wonderful team. 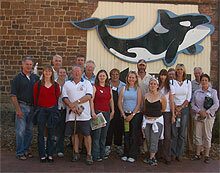 Our Steering Committee, who all volunteer their time are regarded as South Australia’s leading marine education network, with representatives from the major marine and community organizations. Our Centre has been an active participant with the Coast & Marine (C&M) policy planning and legislation meetings as part of the AMLR C&M workers forum, including holding a Meeting at the Centre. 2. We have 44 workers in our Centre which includes 42 enthusiastic Volunteers. Our volunteers have very important roles with assisting the learning of visitors, cleaning our aquariums, mentoring our school’s Year 7 leadership students, feeding the marine creatures, cleaning and even assisting with the Administration of the Centre. 3. Our “Discovery News” quarterly newsletter: www.marinediscoverycentre.com.au/Marine_Discovery/resources/Resources.jsp includes biographies of our volunteers, topical news items, Centre updates and tributes to our 55 sponsors. Which projects do you consider to be the most innovative? a. The Centre’s core business is to educate its visitors and this has been an outstanding success. Being booked out for 2 years ahead is testament to the program. Most visiting teachers try to book for the following year straight away. We have developed some outstanding hands-on interactive models that promote environmental messages. 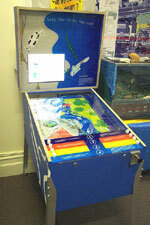 The River Murray Catchment model promotes good strategies using a pin-ball based model. b. We have developed the world’s best Marine Centre website: www.marinediscoverycentre.com.au with almost 2,000 hits per day. This is the number 1 site when “Marine Centre” is “Googled”. The site includes quizzes, games, a Virtual Tour, curriculum packs for sale and more! 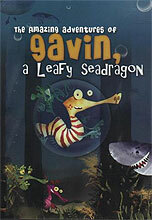 c. We were a major partner in the film “Gavin – the Leafy Seadragon” which was launched late last year. The MDC initiated the idea of developing a film and critiqued the film about our South Australian (SA) marine emblem. This is being promoted to all SA primary schools and every visiting school receives a DVD copy from the MDC. We are also involved in the curriculum package for this film, as Chair of the Advisory Committee. d. We have co-ordinated 27 marine education conferences and Workshops. Last year we held the National MDC network Conference. This outstanding network educates 576,313 people annually. The support for this event by our volunteers was again, beyond the call of duty. Many of our people assisted with the catering, welcoming, liaising and celebrating with the delegates at the Conference.